Well crafted, print looks great. I just wish we would have order the wine tote that can hold more bottles. We ordered the Lime green color. The bag really sticks out at a party or any gathering for that matter. We love this versatile, sophisticated bag! At my company's annual convention, we gave these out and all the people attending loved it as well!! My customers love these bags! We will definitely be ordering from Custom Earth Promos again. These bags prominently display my company's logo and are sure to bring in repeat customers. Happy with the ordering process and the care and attention the Custom Earth staff paid to me. We just received our bags in the mail and are overjoyed at the result! We ordered a large quantity and received them very promptly. Kudos to the Custom Earth Promos staff for putting everything together perfectly! Everything about our bags turned out fantastic! From the attentive customer service to the quality of our bags, we are happy to have worked with Custom Earth and will certainly do so soon again in the future. Our company passed these bags out at a wine tasting and they were a huge hit! Ordered this bags in bulk at a great price. The quality exceeded our expectations! Handles are the perfect legnth to carry wine bottles. I suggest this reusable wine bag. Really impressed with how my bags turned out! My logo looks amazing! These bags are incredibly useful and affordable. This is overall great promotional product. Super glad we decided to order these bags! Our clients use them all the time! Really pleased with how our bags turned out. They were extremely affordable and look amazing. A very durable wine tote, I have full confidence that this bag won't break and will keep the bottles safe. Well made, we ordered a large bulk order quantity and our printed logo is consistent through out the order. Really impressed! High quality and looks wonderful. Really amazing product! Super durable and sturdy. Perfect size for 2 standard 750 ml wine bottles. Very strong handles, we give this out at our liquor store as a promotional item. I own a bar/liquor store, we use this bag any time some one buys 2 bottles of wine/liquor/champagne etc. The customers love it and my brand looks great when my customers bring the bag to outings. We selected the burgundy and black color reusable wine tote. It really compliments the color of our wine bottles, I suggest this color. Plus our printed image on the reusable tote looks great. We switched to reusable bags last year, they are way more practical for wine then plastic or even paper. I suggest using the reusable bags from custom earth promos. We handed this bag out to all of our employees for the holidays with 2 of our new wine bottles we came out with this year. All the employees love it and say that they use for all there family parties. Green eco-friendly products should be the standard across the country, they are in my home state of California. This wine tote is more durable then plastic bags and is very cost efficient in the long run because you will never have to buy a plastic/paper bag again. I own a winery, this is our standard packaging reusable bag. We took a month designing the logo and colors of the bag with CEP's graphic design team. We are very pleased with this product. This was a great way for us to brand our liquor store, this bag gets used as a tote for wine/liquor bottles to parties and get togethers and gets people talking about our store. Wouldn't it be great to find a high-quality, eco-conscious promotional product that really meets the needs of your audience—something they’d want to use over and over again? Custom Earth Promos’ Reusable 2-Bottle Recycled Wine Bags are the answer. Available in an eye-catching 5-color palette to highlight your brand and logo, our incredibly handy tote is made with completely recycled materials. It's a very affordable option for you—and it solves a very particular problem for your audience. It’s a strong, good-looking bag that protects a couple of wine bottles or other delicate glass containers, keeping them safe from breaking in the cart, the car, and anywhere else they're being transported. Plus you’re helping the environment each time you hand one out at a trade show or conference. At a size of 6.75" W, 11" H, and 3.5" D, these durable, practical totes advertise your brand and message everywhere they go. Convenient, attractive and easy to use, your customers will soon come to rely on these helpful bags for grocery shopping, parties, travel and much more. 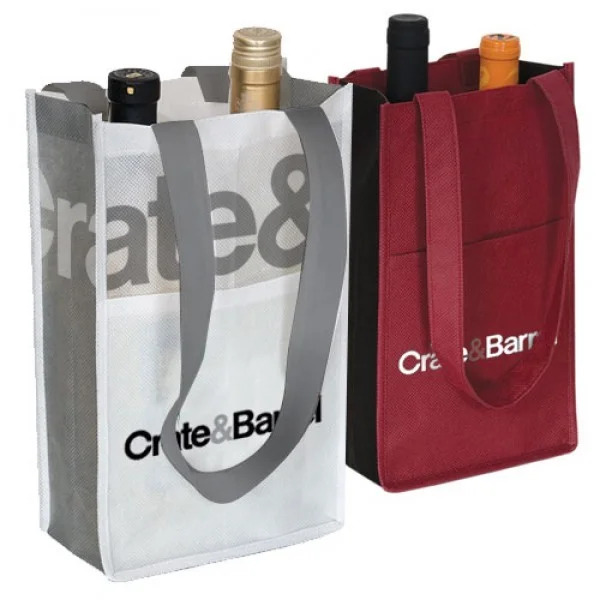 The stylish Reusable 2-Bottle Recycled Wine Bag Collection from Custom Earth Promos is the perfect promotional product to help your business make a unique connection with both existing and potential customers. They’ll love the novelty of this simple, fun and incredibly useful tote, which will turn heads and grab attention for your brand wherever it goes. Just customize your logo, or include some powerful messaging, and instantly you have an exceptionally effective, economical tool to promote your cause, event, special offer, product, service—whatever you need. Whether you give them away as freebies or sell them, the public will be impressed by this stylish, innovative, practically useful bag. It’s a personal touch they won’t forget. Popular with liquor stores, bars, restaurants and even just everyday shoppers, Reusable 2-Bottle Recycled Wine Bags from Custom Earth Promos are the ultimate cost-effective product to give your brand truly constant exposure. They come in five appealing color combinations: Black, White/Gray, Burgundy/Black, Royal Blue/Black & Lime Green/Black. You can select colors to match your brand color scheme or even mix a few new color combinations if you can't decide. Capable of safely carrying 1- and 1.5-liter bottles or other containers for soda, wine and other liquids, these bags feature reinforced handles made from the same 90-gram non-woven polypropylene material that the bags are constructed with. Each tote also includes a front slash pocket to hold a corkscrew, papers or other smaller items, as well as reinforced dividers fitted inside to secure multiple bottles and other products. We make these wine bags exceptionally affordable, so they’re they’re an equally perfect choice to promote any brand, whether your budget is tight or unlimited. Our low prices allow us to pass on savings to our clients, so small businesses and startup companies can pay less to attract new customers and reach a wider audience. And Custom Earth Promos stands behind the quality of every product we make, so you have our assurance that you are always giving your customers environmentally safe promotional products. We perform strict testing on each and every product we make, to ensure that it not only meets our exacting specifications but that it complies with California's Proposition 65. At Custom Earth Promos, we’ll help you conceptualize your ideas and then design and customize your your perfect bag from scratch. We offer high-quality custom imprints for your brand at affordable prices. And our design team can work with you to create your very own original customized imprint, to give your brand maximum exposure to your target audience. Plus our overseas manufacturing plant can handle other personalization options, including insulation, custom sizing, additional pockets, and so much more.